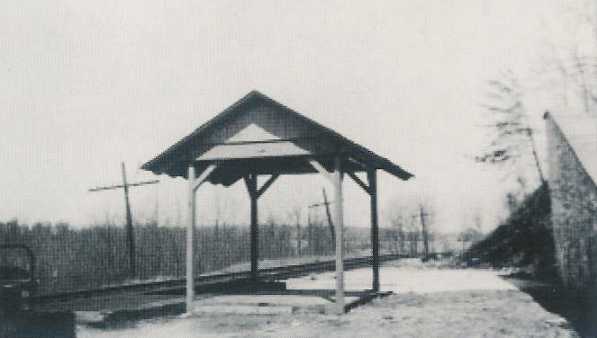 This was origianally known as the Eudowood flag station and was built in 1893 as a PRR W35 structue and was 8' x 12' in size. An agent never manned this station. As per the M&P's rules of operation, a small green and white flag was provided, which was to be displayed by persons wanting to board a passenger train. The railroad's roofed over freight platform is east of the main line in the foreground. The smaller structure beyond is the Towson Heights flag station. The lengthy station sign, with the words "Towson Heights" is visible above the window on the structure's south end. Photo source: Insurance Survey Photo 1940. This rather simple structure is the M&P's Towson Estates flag station waiting shelter. 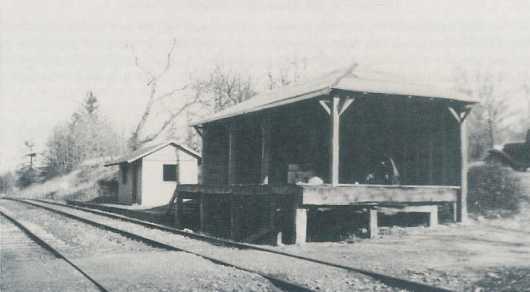 However, for some as yet unknown reason, this station stop never appeared on either the railroad's public or employee timetables. The Towson Heights flag station is just 3 tenths of a mile to the south. Photo source: Insurance Survey Photo May, 1940. Fischer, Rudy, Scenes From Ma & Pa Country - Then and Now; TIMETABLE, Vol 18, Numbers 1, 2 & 3, Winter, Spring & Summer 2003; The Maryland and Pennsylvania Railroad Historical Society, Inc.